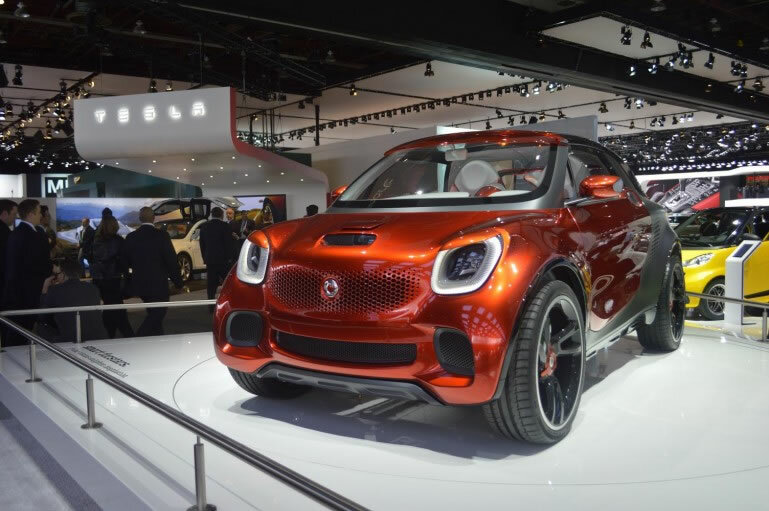 Without question, one of the most unique concept cars being shown in Detroit this week is the smart forstars. 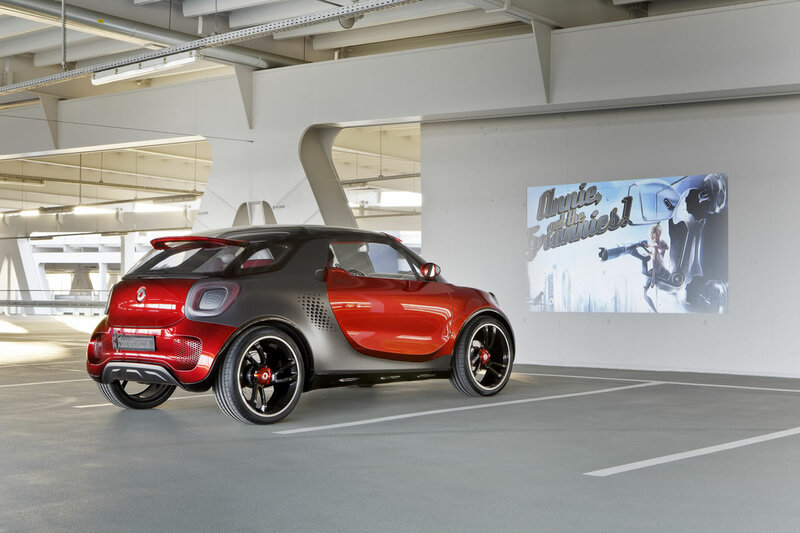 Debuting in Paris last year, the smart forstars has a hood mounted video projector that turns the tiny two-seater into a mobile theater. 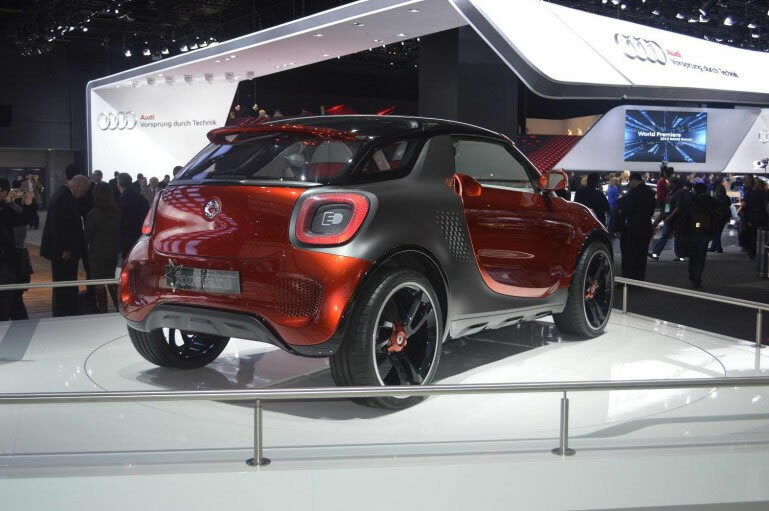 Simply find a flat surface to park in front of, link your smartphone via bluetooth and you’re in your own private drive-in, complete with an additional speaker. 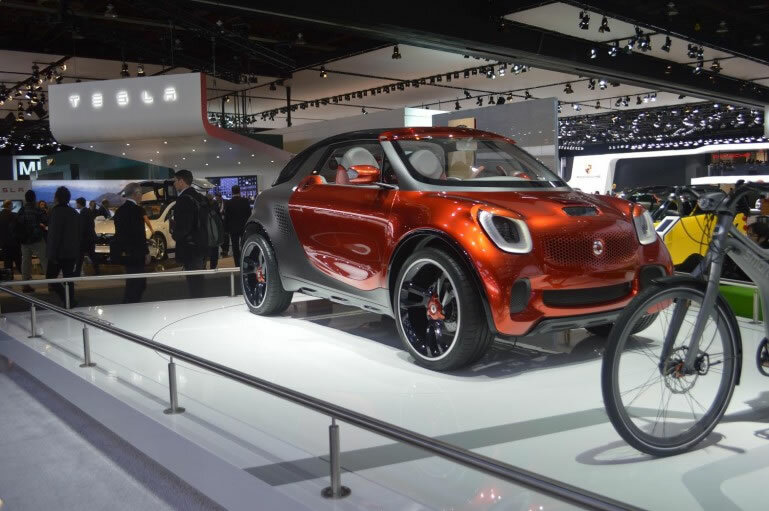 The smart forstars can reach a top speed of 80 km/h (49.7 mph) and is electrically powered by a 17.6 kilowatt-hour lithium-ion batters with a 60 killowatt magnetto-electric motor powering the wheels. Though we will likely never see the projector on the upcoming smart models, the concept does give us a sneak peek into the future of smart’s design direction. 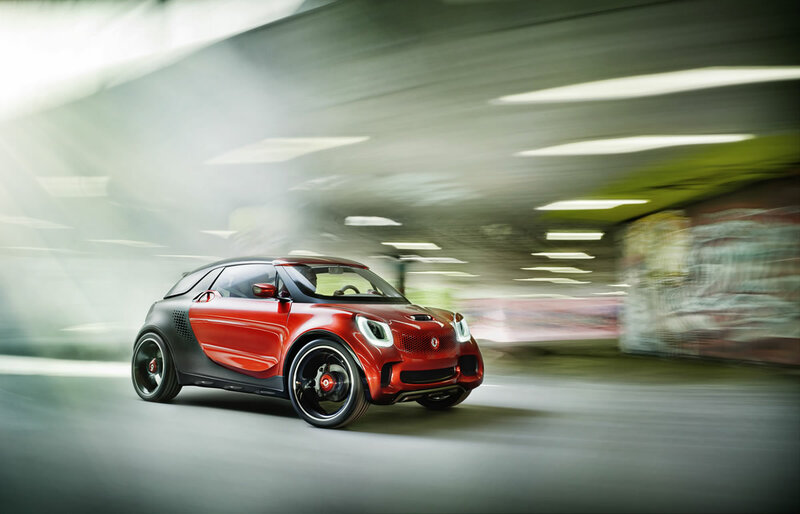 Most notably, the new smart will have a wider track and longer wheelbase than the current smart fortwo. 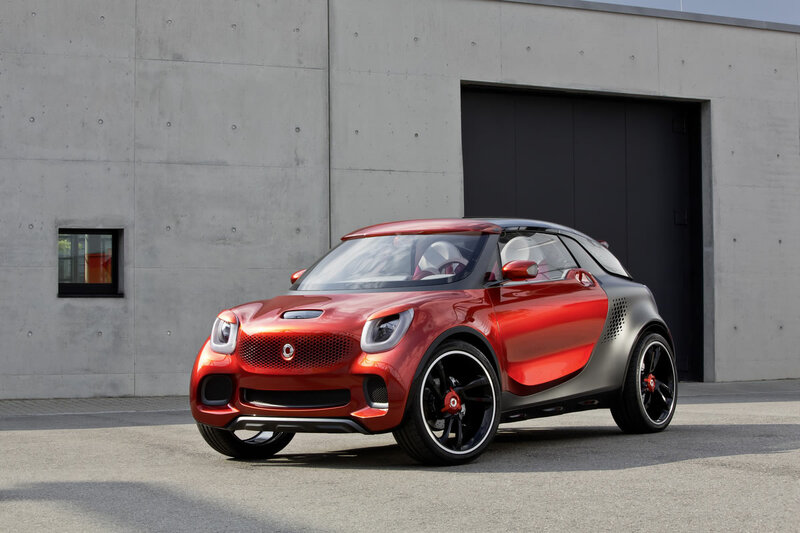 The forward-thinking smart brand brings to life an innovative electric Sports Utility Coupe (SUC) concept vehicle named the smart forstars. 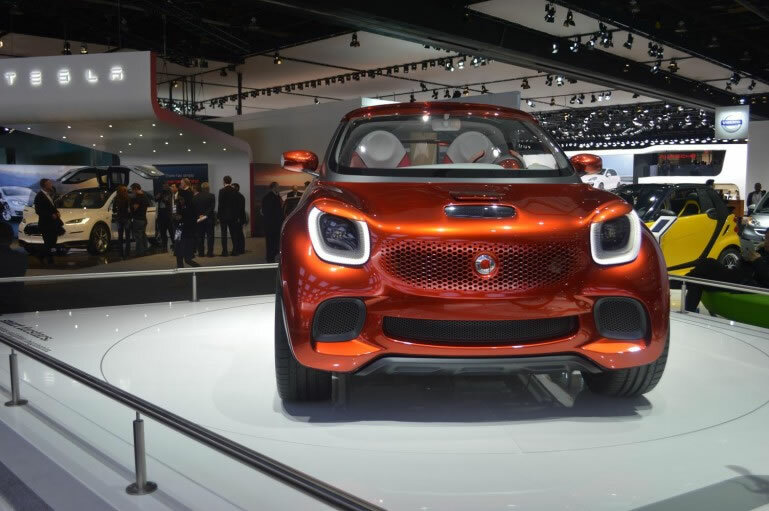 The tongue-in-cheek name refers to the vehicle’s glass roof which offers passengers a clear view of a starry sky or, via the video projector in the hood, turns the car into a drive-in on wheels. 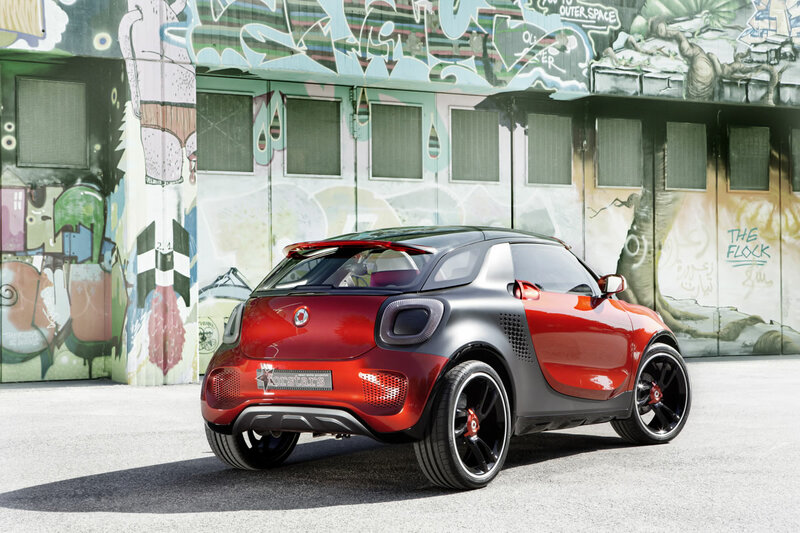 Thanks to its 60-kilowatt magneto-electric motor, the smart forstars is both agile and fun to drive. 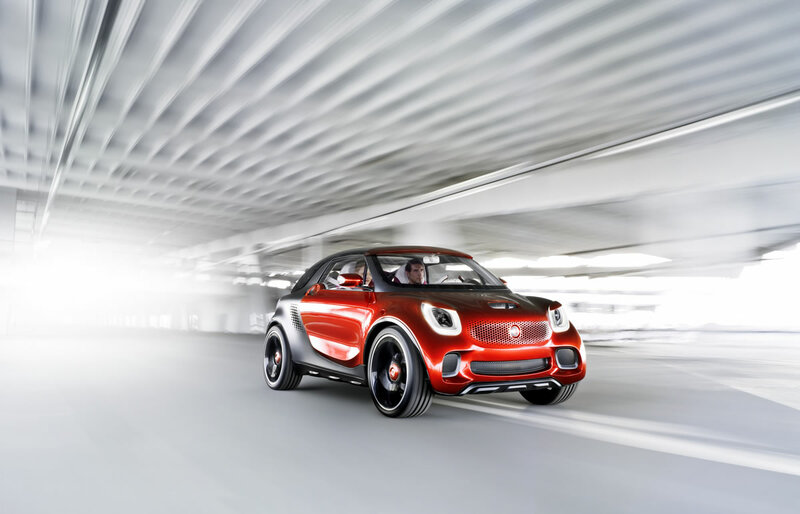 The concept car boasts a powerful 100 lb.-ft. of torque and a top speed of 80 mph. 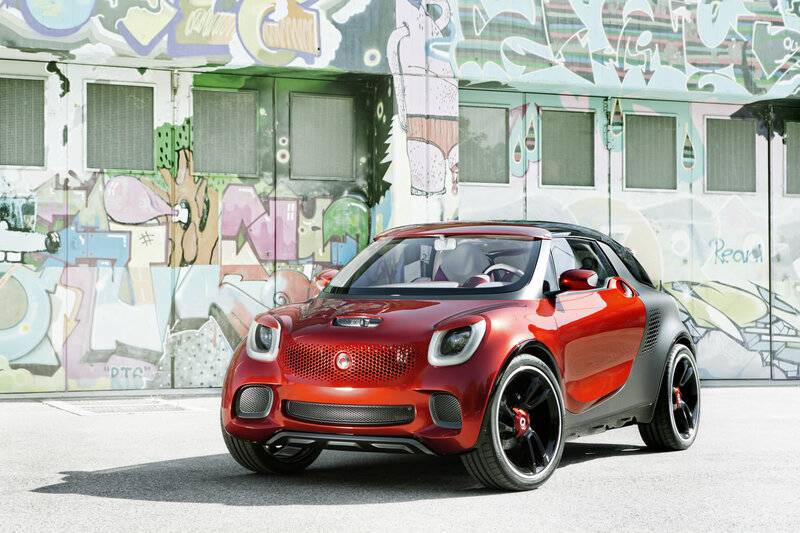 With its state-of-the-art lithium-ion battery, the smart forstars has a capacity of 17.6 kilowatt-hours of electric power. The forstars has ample space for two people and a generous cargo area under the glass tailgate (length/width/height: 139.8/67.3/59.3 in.). 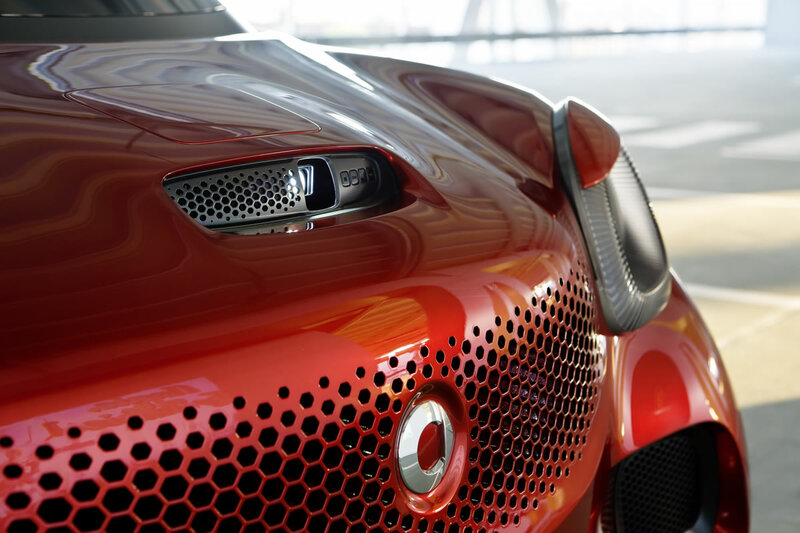 The car needs only a flat wall for a spontaneous cinematic experience. The projector’s media player (located in the hood) is operated via Bluetooth® from an iPhone®. 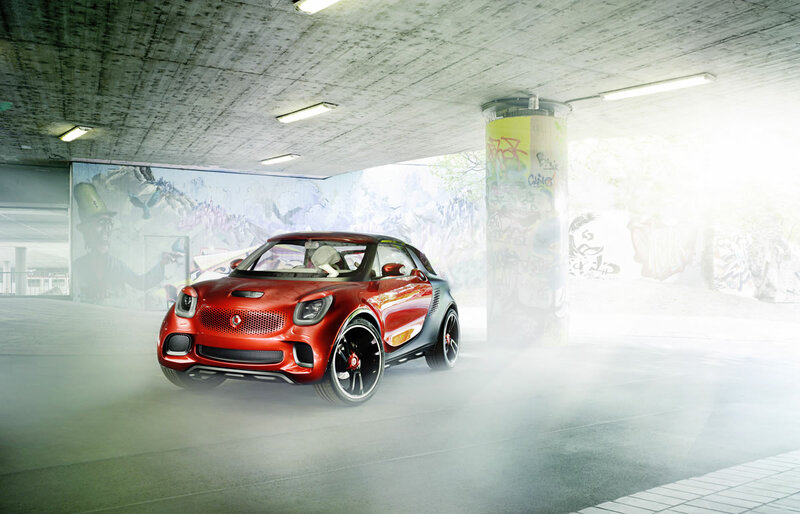 To add to the viewing experience, a high-quality sound system with additional loudspeakers is built into the ventilation openings behind the doors. 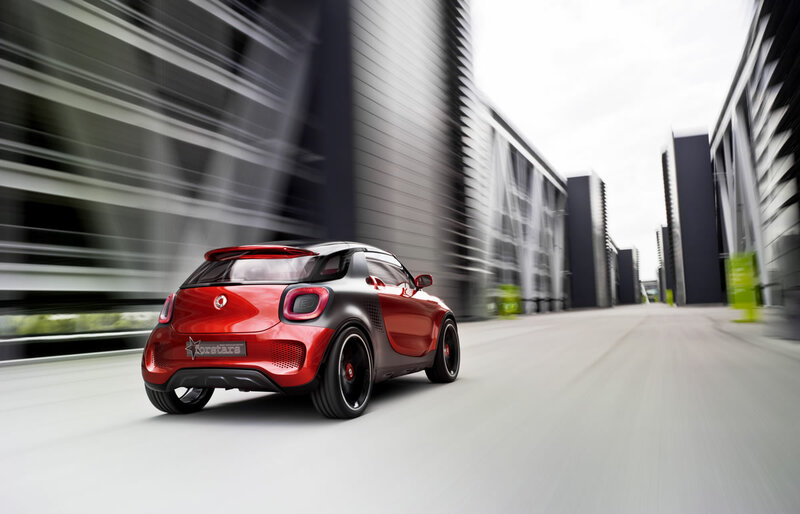 The smart forstars boasts striking new features which offer a sneak peek into the future of smart’s design direction. 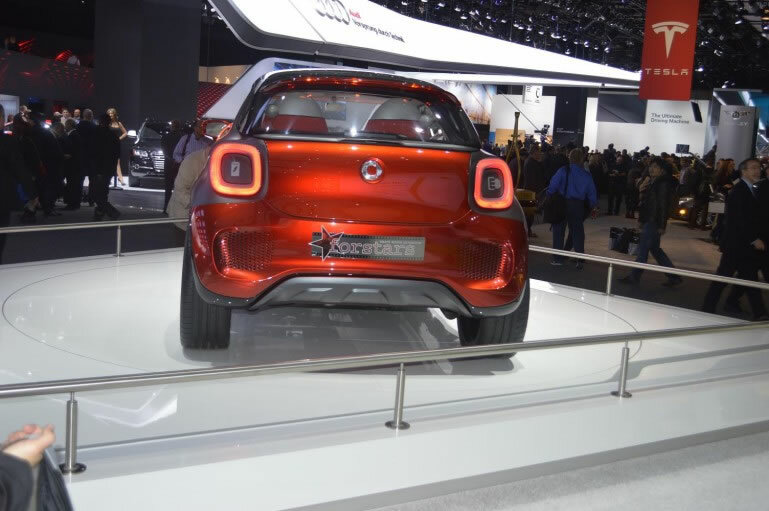 The sporty forstars is painted in the eye-catching “alubeam rouge” finish, giving the car an edgy and futuristic look. 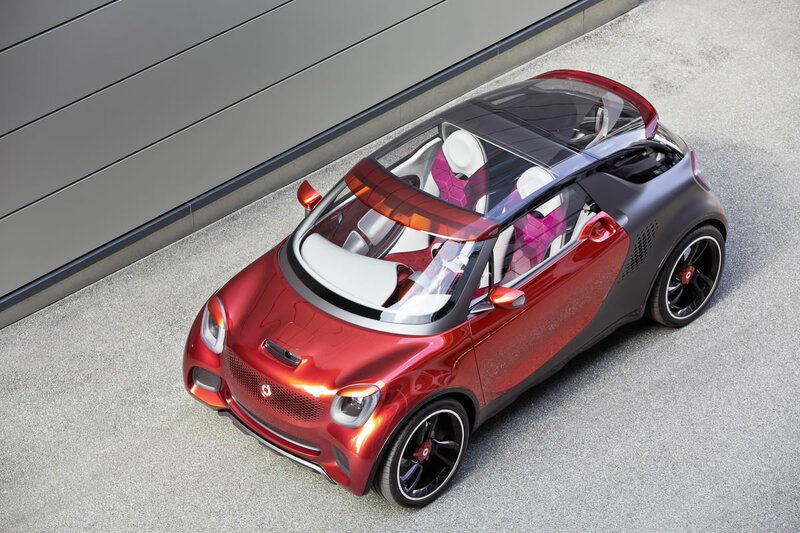 The body color is contrasted against the matte titanium-colored tridion safety cell. 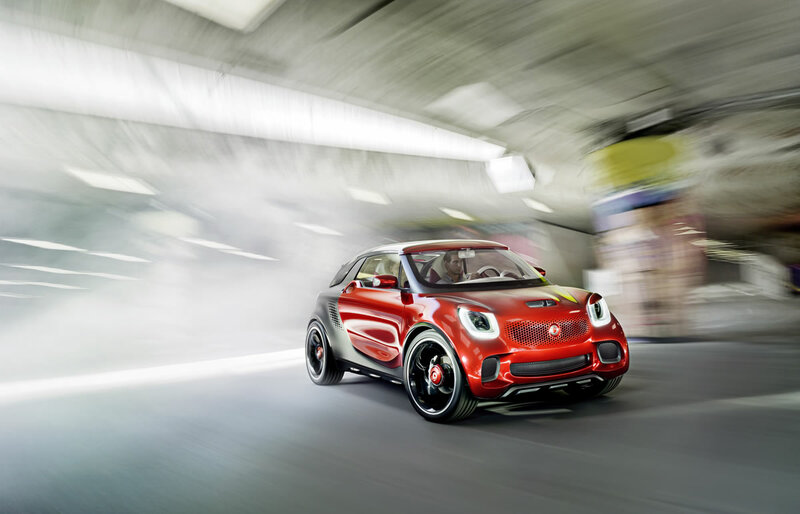 The concept car has a longer wheelbase than the current smart fortwo (97.2 in./plus 23.7 in.) 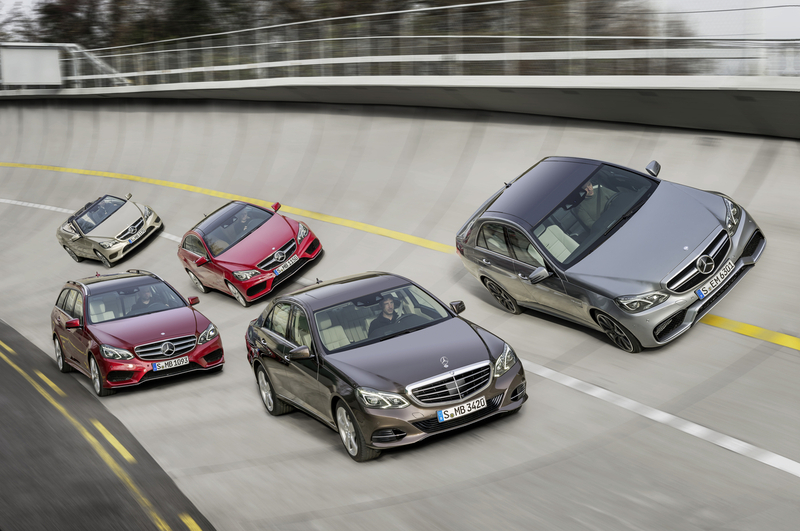 and a wider track (front 58.1 in./plus 7.6 in., rear 58.1 in./plus 3.5 in. ), helping to emphasize its sporty look. 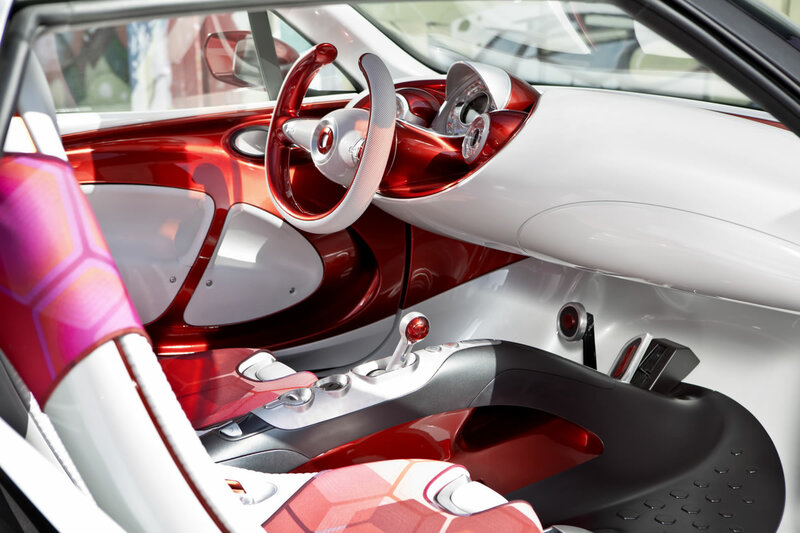 Stylish yet uncomplicated, the interior features sleek, mother-of-pearl white surfaces with brushed aluminium details. 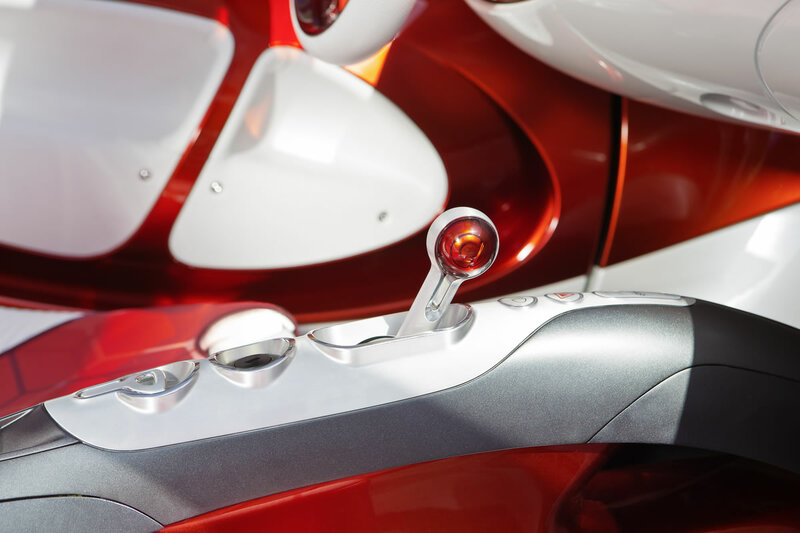 The distinctive “alubeam rouge” body panel color has also been carried into interior accents. 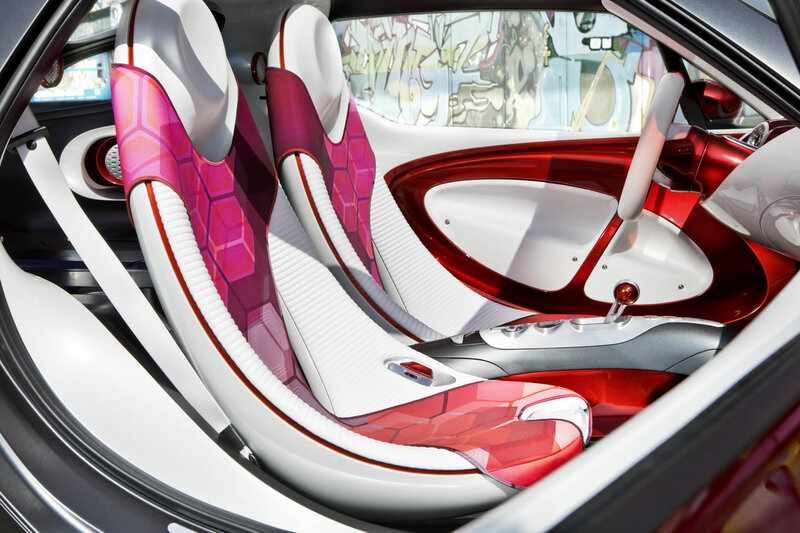 The seats are covered in a red graphic print and trimmed with a high-quality white leather and exquisite white piping. 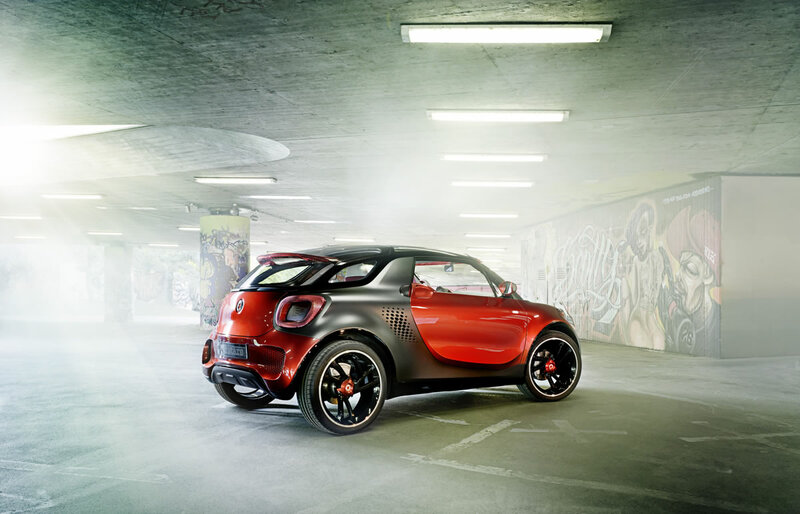 Perforated leather on the door panelling adds a modern touch. 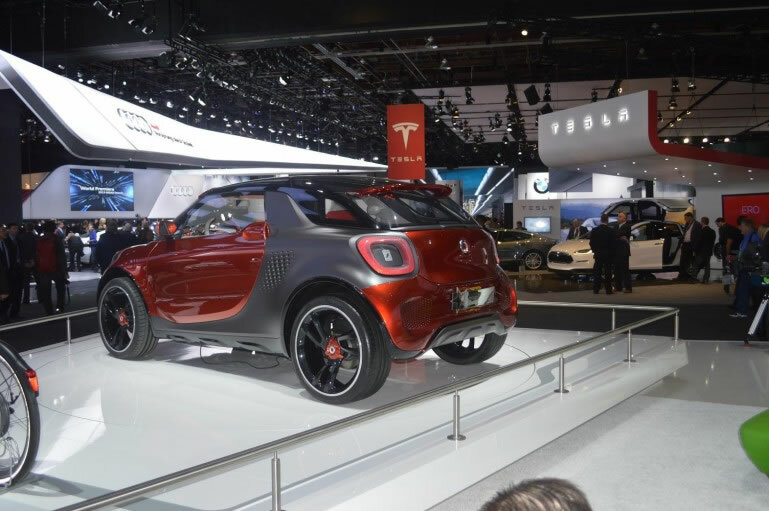 Rather than a conventional rearview mirror, the smart forstars features a smartphone in a holder at the top of the windshield. 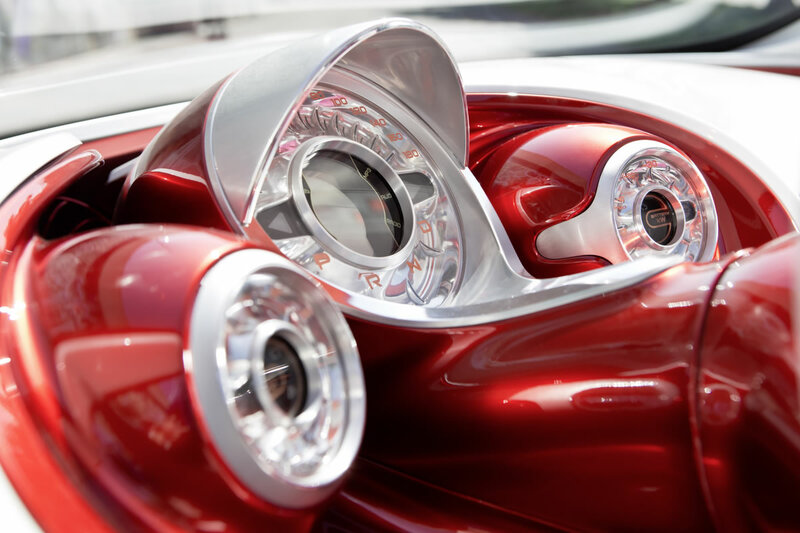 The driver can see what is happening on the road with the help of an integrated video camera. The smartphone also serves as a media source and controls the projector.